Bookends and frames with European design. Fine Italian craftsmanship. Handcrafted frames sold individually. Embossed shagreen finish. Brass hardware. Suede lining. Handcrafted frames sold individually. Embossed shagreen finish. Brass hardware. Handcrafted photo frame. Embossed-shagreen finish, bass hardware, and suede lining. 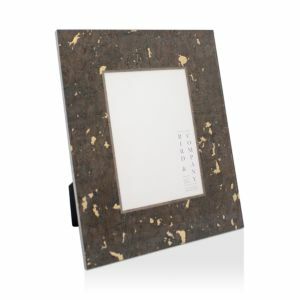 AERIN Archer Frame AERIN Armbroise Frame, 4" x 6"
AERIN Armbroise Frame, 5" x 7"
Metal picture frame. Brass-plated zinc. Armbroise frame. 5.3"W x 7.3"T; holds 4" x 6" photo. Brass plate. Handcrafted frame. Embossed shagreen finish, brass hardware, and suede lining. Handcrafted frame in hammered brass. Handcrafted suede frame with brass details. Silvertone metal picture frame. Frame inspired by Art-Deco mirrors. Brass. Lacquered finish never needs polishing. Black wood back. Frame inspired by Art-Deco mirrors. Sterling silver and velvet. Lacquered finish never needs polishing. Frame inspired by the classic lines of silver accessories from the early 1900s. Sterling silver and velvet. Lacquered finish never needs polishing. Bird & Co Ivory with Silver Frame, 5 x 7 Bird & Co Ivory with Silver Frame, 5 x 7 Waterford Crystal Icon Frame, 5" x 7"
Plexiglass Plexiglass Innovative olive cuts surround the Icon Frame 5" x 7", drawing attention to the memories kept inside. Icon giftware brings sophisticated luxe living to the home and is perfectly presented in classic Waterford packaging with a decorative Jeff Leatham sleeve, ideal for gifting. Handcrafted frame. Silver-plated metal with platinum-rod edging. Wood back with silver-plated catch. Handcrafted frame. Silver-plated metal and blue-hued glass. Wood back with silver-plated catch. Handcrafted frame. Silver-plated metal with gold-tone edging. Wood back with silver-plated catch. Handcrafted English-design frame. Silver-plated metal with clear glass edging. Wood back with silver-plated catch. Carrs Of Sheffield Reed & Ribbon Frame, 4" x 6" Carrs Of Sheffield Silver Frame, 8" x 10"
Sterling silver photo frame. Wood back. Made in the United Kingdom. Classically elegant and refined. 9.5"W x 11.4"T; holds 8" x 10" photo. Smooth silver rimmed with a touch of beaded texture. Glass insert. Wood back. Made in the United Kingdom. Bookends, set of two. Iron. Unglazed porcelain owls perch on a marble and nickel base. 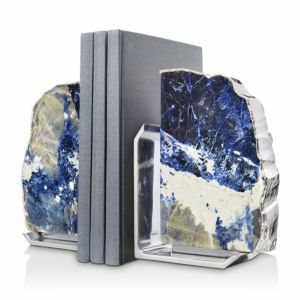 Handcrafted bookends. Iron and marble; veining color and pattern of marble may vary. Sold in pairs; each, 4"W x 5.5"D x 6.5"T.
Cast iron Elegant and functional, these bookends are a welcome addition to any shelf. Handcrafted bookends. Made of 24-kt. gold-plated brass. Marble base. You'll have a whale of a time displaying your books between this charming set. This clean and contemporary magazine file is a timeless addition to your desk or workspace. Seven acrylic dividers. 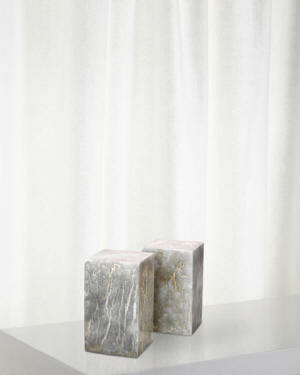 Handcrafted, solid marble hand-carved bookends with a silver and gold wash patina. In this magnificent collection of the most spectacular jewels of the twentieth century, fine jewelry historian Vivienne Becker selects the quintessential bijoux that represent the milestones of jewelry design of the last one hundred years. Hardcover book. Sometimes compared to the Saint-Tropez of Brigitte Bardot in the 1950s, Comporta, with its relaxed pace and artistic community, is the ideal destination for those looking to wander off course. Its the newfound favorite of famous personalities. This distinctive setting challenges the minds of architects and designers, yielding unique spaces that delightfully blue the line between interior and exterior. Within these pages, the region's characteristic cobalt blue is reflected from the sky and sea to the walls, shutters, and design pieces that adorn its homes, both picturesque and bold. This two-volume hardcover set by Sebastiao Salgado is the result of an epic eight-year expedition to rediscover the mountains, deserts, and oceans, the animals and peoples that have so far escaped the imprint of modern society. Backed with a scrollwork overlay, this elegant bookcase is beautiful whether it is empty or full. The three shelves are adjustable or removable; with the wire management ports in the back of the bookcase can accommodate a 48" television. The two drawers in the center are faced in faux crocodile leather. Modern étagère with an heirloom level of quality. Made of Lucite® and polished brass. Metal and glass bunching bookcase. 32"W x 14"D x 82"T. Five shelves; one drawer. Brushed-brass finish. Visually appealing étagère featuring distinctive lines and offset shelves that have the appearance of floating. Crafted in tubular iron with silver leaf and glass shelving, it provides a unique option for a room divider, display unit or as a focal point for the room. These beautifully scaled and designed bookcases, etageres and curios offer the best home your books, mementoes and cherished photos will ever have. The style of this versatile bookcase is a warm, modern feel perfect for today's upscale, relaxed lifestyle. Crafted in sandblasted oak in a "Greige" color, highlighting the wood grain. Framed in by plated nickel and complimented by a sophisticated curved bar pull on the door. It features five fixed shelves and one door with a fixed shelf behind with a soft close door hinge. Easily at home by itself as a generous display/storage piece, it also works perfectly in pairs or in combination with the matching entertainment console. A breakfront cabinet with three sections fitted with reeded drawer fronts and doors, each decorated with a bar handle and finished in antiqued beluga. The central display area is fitted with a mirrored back, glass shelving, and touch lighting. Handcrafted display chest. Stainless steel deck in vintage nickel finish. Open design with four inset tempered glass shelves, including top. Two drawers with cast geometric design on drawer fronts. A wonderful and functional addition to any room this lovely étagère can be a bookcase, room divider or accent to any room. The unique spherical motif on the sides are highlighted by the rich, lightly distressed walnut finish. Handcrafted gold leaf painted iron étagère. Four clear glass shelves. Étagère fully finished front and back; can be used as room divider. Frame made of metal; shelves made of hardwood solids and hickory and pecan veneers. Brookhaven display cabinet. 40"W x 18"D x 89"T. Crafted of metal with antiqued iron finish and welded frame. Three glass shelves with plate grooves, center LED light, and adjustable shelf behind lower doors. Handcrafted display cabinet. Oak and ash frame. Two wood-framed doors with inset tempered glass panels and patterned cast grilles. Tempered glass side panels. Two-tone contrast with a textural twist. Washed black acacia forms spacious open shelving, while natural cane weaves to cover dual mango-framed doors. A simple Parsons-style base and black iron hardware pulls offer eye-catching contrast. Black oak adopts horizontal channeling for design-forward allure. Rich tones are cooled via the modern look of clear glass and waxed black-finished iron hardware. Four open-front doors and tiered shelving for spacious cabinet storage. Gorgeous and versatile this generously scaled étagère has an organic feel in a distressed, washed tonal finish in a buff almond color with grey undertones. Finished on both sides it can float in a room, be a room divider or stately display case. Shelves in center and both sides.